Our Spanish Tiles are a classic collection of hand painted tiles inspired by centuries-old Spanish tile designs. The Alcala pattern was chosen by the restaurant owner, Patricia Estorino. She wanted to create the same charm and ambiance for the new restaurant, Gustazo, that you'd experience at a cafe in old Havana, Cuba. The focal point of the room is a mural that uses 6"x6" tiles and framed with 3"x6" and 3"x3" border tiles in the same pattern. Additionally, the 6"x6" tiles are used as accents and placed randomly in the field tile pattern. Patricia Estorino, the owner of Gustazo, is a quiet and thoughtful person. From her first inquiry, I knew she had spent time looking for the right tile. Patricia let me know what design she wanted and how many tiles of each size she needed. The tile would help create an environment for the restaurant that reflects her native culture. If you are in the Boston area and want to try some traditional Cuban cuisine, stop by the Gustazo Cuban Cafe. They are located at 289 Belmont Street, Belmont MA. They recently received a glowing review from @tablecritic. But, that's no surprise to Avente - we new they had good taste before they even opened their doors. Keep dong what you love, Patrica! Congratulations on the great review and Avente is glad we could help. Our hand painted Spanish tile patterns are also available in a 6"x6", 3"x6", 4"x4", 2"x2" and 1"x1" formats. Currently, we are out of stock on 6"x6" and 3"x6" Alcala. New inventory will be arriving soon. Spring is here and nothing says spring like a sale on our Bird & Nest tiles. The days are getting longer and warmer. The birds are singing and we want to give you something to sing about as well. Celebrate spring and Save 15% on any Bird & Nest tile purchased through May 31, 2012. No coupon needed. Place your order online. This amazing line of nature-inspired relief tile comes in rich, pooled glazes of blue and plum hues. The large decorative tiles are done in relief and come in 8"x8" and 8"x10" accent pieces. Each tile is equipped with a notch for easy hanging. They make great accents for the patio and kitchen sans grout! They make great mother's day gifts, too! Tile Tip: Use cement tile borders to create interest and define the space. Choose a design that has a border pattern to achieve a "tile rug" effect. You can also mix and match patterns or use a solid color cement tile in the same or different size as the field pattern. Borders can include a single, double or triple row of tiles to frame the floor. You can even use more than two border patterns and have more than three rows of border tile; but, this works best when framing solid color field tiles. In this installation three border patterns are employed. The Puerto Plata Cement Tile border is used on the outer/inner border run. Between this border, a row of Santiago Cement Tile border is used with Cuban Heritage Design 120 double border. A triple border is used around the Cruz Saldrigas field tile. The Cruz Saldrigas border is surrounded on each side by a row of Alca border tiles, creating this triple border. Learn more about border patterns with cement tile and read our post, Using Cement Tile Borders. After you have made some choices for what style and type of tile you would like for your project, the next step is to determine the tile lay out. This is the planning stage to ensure that your project comes out looking perfect. To start things off I measure the floor or wall areas to be tiled. Then using graph paper I transfer these measurements to my sheet. There are also software programs that are available from Laurel Creek Software and others that will aid in the process. I, personally, have not used any so if you have, please leave us a comment below. A dry layout ensures a successful tile installation. Problems not identified in the design can be avoided before installed. Now once I have discussed the desired pattern with the client, I then have to see how it will work into the space. Therefore my next step is to take the tile dimensions and put them into the graph and see what it will look like. I also have to keep in mind what will be the most visible areas so as to avoid smaller broken patterns or tiles. Mistakes can be avoided before any tile is even set. Proper planning can avoid issues such as this. In a shower installation, layout is vital for a great looking project. If you look at this photo with the corner, transition band, straight and angled tile, you'll will see just how many things could go wrong without planning. After I have done my planning on paper, I then take some measurements in the space that needs to be tiled and with a chalk line, I snap reference lines on the floor or wall. I can then do a sampling with the actual tile to see if the pattern I decided on was going to work out. This phase of the project is where I spend a great deal of time because once I have started to actually lay the tile in thin set, it will be too late. It is also important to note that if using custom tile or varying sizes that the pattern be fully laid out dry to make sure that it fits and looks perfect. Also color variations in tile from varying lots can be spotted and moved to different places within the layout or taken out all together. Doing the entire project in a dry layout does take extra time, which of course relates to a higher cost, but a beautifully finished and matched end product are well worth it. A dry layout in progress. Once I have dry laid the tile, checked the overall pattern and colors, made sure that all is good I can then start the process of applying the tile in thinset. You have surely heard carpenters saying, "Measure twice, cut once." The same applies to tile work. Without proper planning and layout tile, a project such as below could have a totally different look. Beautiful designs and layouts are not an accident. Careful planning and preparation are the keys to a successful project that you will enjoy for years to come. A wood edge is the least expensive option and the least desirable. Wood does not provide a durable and long-lasting solution for a kitchen - especially near wet areas like a sink. However, it can be easily replaced and can provide a nice accent to the cabinets. if you will be using wood edge trim, fasten a 1x2 batten to the face of the countertop so the top edge is above the top of the counter. If you can't find V-Cap tiles to trim the edge of a counter, consider using a decorative or relief borderstrip. This option will be more expensive than using using field tile and can be more expensive than a V-cap - depending on the borderstrip. Make sure you can purchase a bullnosed tile in the same glaze as the rest of the counter. Alternatively, you can create a borderstrip with glazed bar tiles or decorative caps. If you are using bullnose tiles for your edge, a batten that is the same thickness as the edging tile, plus 1/8" for mortar thickness, should be fastened to the face of the countertop so that the top is flush with the counter. This solution is the the least expensive of the three options that use tiled edging. You might be able to avoid lots of cuts if the counter tile comes in a format that matches the width of the counter (like 1" x 2"). Install the same as with the borderstrip. You can use bullnose tile to finish the edge of a tiled window as well. For something different, set the bullnose tiles on the wall surface, instead of the recess. In this case, set the recess tiles first, then the bullnose. For a professional look that is maintenance-free, consider using a special type of trim tile tile called a V-cap. V-cap tiles are expensive; but, you'll save money on installation costs. They do tend to break easily before they are installed; so, purchase about 10% more than you need. To install V-cap Tiles, a 1x2 batten attached with screws along the reference line will guarantee straightness. Lay out tiles in a dry run using spacers before you actually install them. L-shaped counters should be tiled starting at the corner and working outward. All other counters, start at the sink to ensure that there will be equal sized cuts on both sides of the sink. To prevent yourself from having to cut very narrow tile segments, you may need to shift your starting point. You can tile over a laminate countertop. Just make sure that it is square, level and structurally sound. The surface will need to be sanded before setting the tiles to ensure proper adhesion. If you need to remove your existing countertop, remove the screws from beneath the countertop and if needed, cut the construction adhesive with a knife. Tiled countertops aren't as popular as they used to be. Solid surface counters like granite and more recently Silestone and quartz have become the new standard. However, I frequently here designers mention that client who installed tiled counters many years a ago still love them and prefer them. Tile is still an excellent choice for a countertop because it provide a great value, excellent durability with limitless design options. 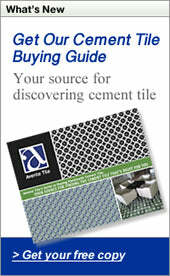 Today's post answers common questions about cement tile. I like cement tiles, but how much do they cost per square foot? The cost for most cement tiles ranges from about $8 per square per foot for solid color tiles to anywhere from $9 to $17 per square foot for patterned tiles. Cost depends on the size, pattern, color and finish selected. On small orders (less than 100 SF) freight costs can be as much as 30% of the cost. On larger orders (500 SF or more), freight will be about 10% of the cost of the order. Few flooring materail offer the show-stopping appeal of cement tile. I'm trying to cut costs, why did you add an additional 10% in waste or overage to my order? We add an additional 10% to the quantity of tile orders to account for waste, unless you ask us not to. This overage or waste allows for uncertainty in dimensions, tile variation, damage during installation, grout width and damage that may occur during shipping. I admit it seems excessive. But, I would be a very rich man if I had a dollar for every time someone has called and said, "Bill, we are short 3 tiles, can you get me more right away?" It costs much, much more to make and ship those three tiles than if we had ordered 20% more up-front. Things happen, tiles get broken during shipping and installation. The color of a few tiles is off. Dimensions are wrong or someone makes a mistake during installation. Waste and overage account for these problems and avoid spending money on rush shipping, bringing back a labor forces, or trying to match tiles from different dye lots. Where should I use polished tiles? Select tiles with a polished finish for most residential applications and all wall applications. Do not use polished tiles outdoors. Polishing tiles for outdoor applications is like throwing money down the drain since the polished finish will not last outdoors. Not all manufacturers can provide polished tiles. The finish on factory polished cement tiles simulates the "patina" a cement tile might develop after years of being cleaned with wax and water. Factory polishing is a mechanical process that uses a high-speed rotary buffer, mild abrasives and water to "polish" each cement tile. Can I get a patterned cement tile with a bullnose edge? No. Only solid color cement tile tiles are available with a bull nose in some lines. Take a look at the trim options offered in our Heritage Molding and Bullnose Trim. Do I need to seal cement tile? Yes, plan on sealing your cement tile installation with a "high quality" water-based penetrating stone and tile sealer. Cement is a porous material and we recommend that you seal your cement tile installations to minimize staining and reduce problems from water. Sealing cement tile can help mitigate problems like efflorescence. Have a question about cement tile? Let us know by posting a comment or sending an email. We'd love to help! If you want to achieve the classic look of a "tile rug" on your floor, you will need a border. The border tiles should frame the patterned field tile or solid color tile. The border needs to provide interest without interrupting the geometry of the field tile. Today, I'll show you several different ways to create borders with cement tiles. Cuban Heritage Cement Tile Design 210 in an alternate color way is shown here with a single border. Many patterns are designed with a border or double border. Single border tiles utilize a single row of tiles around the pattern and generally include a corner piece in the design. Double borders require two rows of tiles and work best in large, traditional spaces. Double borders in Cuban Tile patterns occur frequently because they work well bold colors and elaborate patterns. A single row of border tiles is ideal for smaller spaces like residential hallways, bathrooms and bedrooms. Existing border patterns achieve that done-by-a-designer look with ease. If a pattern you love doesn't have a border, consider using a complementary border from another pattern. You can mix and match field patterns with border patterns and achieve a great look. In this design from an Avente customer, the Sosua Cement Tile is framed with Bayahibe Border Tile to create a traditional rug design. Be creative and have fun. Combine different cement tile border patterns to create a lot of interest around the edge of a room. This idea works well for a dining room where a large table might hide much of the pattern. In this installation, Puerto Plata Cement Tile border is used on the outer/inner design border run and the Cuban Heritage Design 120 is used on the inside border creating the circle design pattern. Here's a ferw border patterns are popular and can be used around solid color tile or patterned tile. Hope you found some border inspiration for your cement tile project!